A Lady Reveals Nothing: Can We Just Talk for a Minute About Minnesota? Yah. Blah blah blah. I haven't seen a Minnesota winter for two years because I've been TRAVELING THE WORLD. We know. Shut up. What? You've never heard of broom ball? You must live South of the Mason-Dixon line. It's hockey. But instead of skates, shoes. Instead of sticks, brooms. Instead of a puck, a tiny little soccer ball. A million years ago, my brother-in-law John dug a real life pond in his and my sister's front yard because he just really loves having a pond on his property. Of course, in the winter it freezes over and makes the perfect hockey skating rink. But when you have big hockey / skating parties, as will happen, the better skating professionals leave the kids and bad skaters in the dust. Ever the fair and maybe-a-little-bit-conniving dude, these days John skips the skating and instead hosts several broom ball parties every year. He says this levels the playing field. He sprays the rink with hose water and gets it extra slippery so that everybody is slipping and sliding and trying to gain a little momentum to go running after the ball. I say it's a little like Fred Flinstone, when he starts running ten minutes before he goes anywhere. 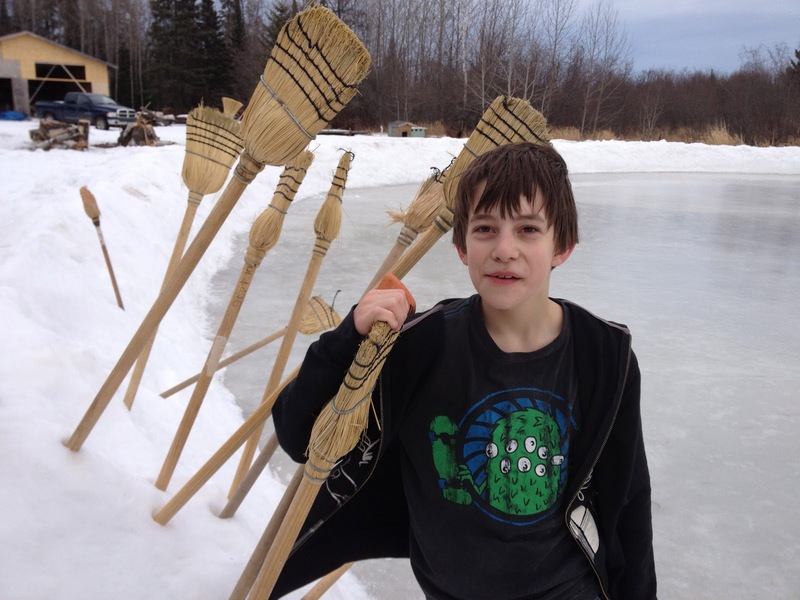 My nephew Skeeter, picking out his broom. Bloodthirsty gang, trying not to fall down while chasing a ball. Now why didn't his Auntie make him wear hat, mittens and a scarf? Because it was SO nice out, that's why. BROOM BALL is officially getting a "Currently Obsessed With..." tag. Ha. It is crazy, I ain't gonna lie. And to think there are people in this world who's ponds don't freeze. I love this "family" fun and the pond! Kady, if you come back to Az. we could sit in my pond. It never freezes, but I could throw some ice in it for you and we could sweep the ice around. Miss you too!! Your nieces and nephews are adorable. 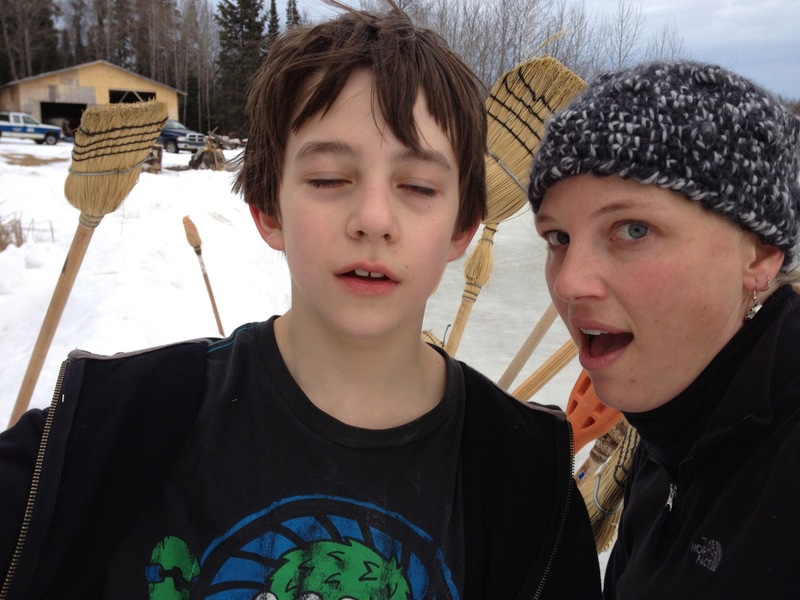 Takes me back to the days of growing up in rural Wis.
Mitch's sister broke her sternum playing broomball. She was running with her broom sticking straight out from her chest and slid into the boards. Broke her chest. It's the most dangerous game. I love the pic of Miles. Being new to the land of the free I was invited to a broom ball game, "its like its name Broom and Ball on ice" so I thought why not, until a couple of guys turned up in hockey gear and it went down hill fast, but if no one was on skates I imagine fun like the pictures not like the game last year. I had no idea broom ball was so dangerous. Of course you get the occasional bruised shin (from whacking) or broom-smacked face, but BROKEN STERNUM? I guess I should also have labeled this post "near death" and "afraid".